The Mars Exploration Rover Opportunity mission officially ended last week, as we accepted the reality that Oppy had gone silent forever. Engineered to last only three months, Oppy persevered for nearly 15 years and traveled over 28 miles, working longer and traveling farther on an extraterrestial surface than any other lander. Oppy’s last transmission, translated into plain-speak, is almost heartbreaking, if we allow ourselves the indulgence that rovers, like humans, can feel: “My battery is low and it’s getting dark." Repeated efforts to revive Oppy failed. Even the Beatles’ “Here Comes the Sun” didn’t help. Sometimes, love isn’t all you need. And, so, as if speaking to a departed friend, NASA sent one final transmission: Billy Holiday’s crooning, “I’ll Be Seeing You.” Good-bye, Oppy. And thank you. Oppy taught us much. Among its many scientific achievements was finding evidence that Mars once had flowing water, and hence may have been able to sustain life. Oppy discovered hematite pebbles, nicknamed “blueberries,” littering the Martian landscape. As realized by University of Utah geology professor Marjorie Chan, these were strikingly analogous to rocks formed by groundwater in southern Utah. These discoveries may yield no immediate translational benefits. 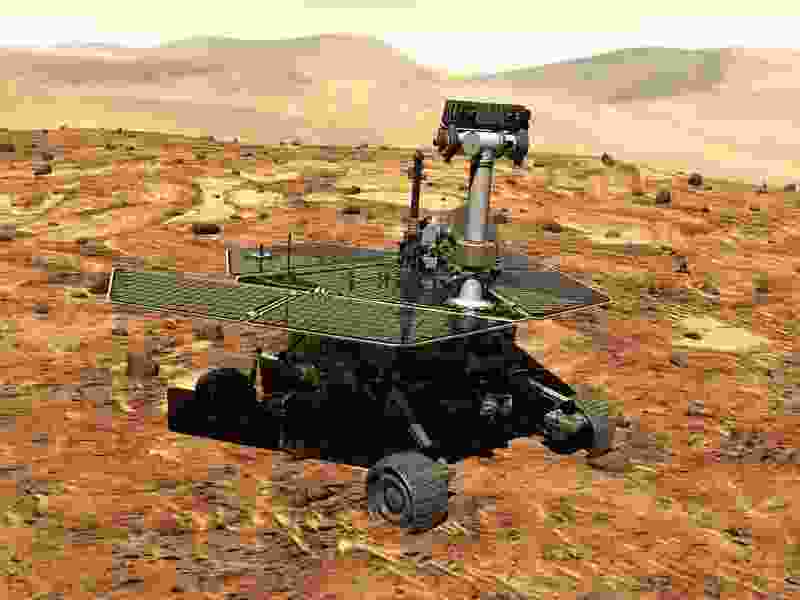 But what Oppy also helped teach us is arguably even deeper: The STEM fields — science, technology, engineering and math — do more than provide us with practical advances, as important as those are. They also help shape ideas. Key ideas about our universe. And hence about ourselves. Ideas so important that people have been willing to die for them, and to kill for them — as history repeatedly shows. In 1600, the Italian philosopher Giordano Bruno was burned alive for promoting what was then heresy, but is now standard cosmology — that stars are suns with their own planets. He repeatedly refused to recant. One of Bruno’s inquisitors, the theologian Robert Bellarmine, subsequently also confronted Galileo Galilei about another heretical cosmological idea: That the earth moved, and was not the center of the universe. Galileo was found suspect of heresy, and remained under house arrest for life. The Catholic Church ultimately apologized — in 1992. Yet still today, roughly one-quarter of Americans believe that the sun revolves around the earth, rather than the other way round. Like the earth, comets orbit the sun, but this too wasn’t understood in earlier times. The accurate prediction of the arrival of Halley’s comet was of deep conceptual importance, as Neil de Grasse Tyson’s remake of “Cosmos” helped inform us. The prediction indicated that comets were not omens of disaster — etymologically, “bad stars” — or signs of an angry god seeking revenge, but were instead subject to natural, discoverable laws. Science education matters. Because knowledge matters. Because understanding matters. Because truth matters. Science requires imagination to create new ideas and find connections between old ones. But science also requires an empirical reality check. It’s not just imagination; it’s “imagination, in a tight straightjacket,” as Richard Feynman notably proclaimed. Science isn’t always right, particularly in early stages when evidence remains incomplete. But its ability to undergo correction is its strength. A Catholic priest, Georges Lemaître, proposed an expanding universe and the “Big Bang” theory — against then-prevailing scientific wisdom. But he resented Pope Pius XII’s proclamation that such findings provided scientific validation for Catholicism. Lemaître’s work became scientifically accepted because of confirming observations, not because of a papal fiat regarding Genesis. Many Genesis claims are demonstrably false. Night and day were not upon the earth, and fruit trees didn’t grow on earth (day three), before the sun and stars were created (day four). Such myths obscure a more astonishing truth, unavailable to the peoples of millennia ago. As Carl Sagan and Tyson have helped us understand, we are star stuff. The atoms that make the earth, and the fruit trees and our very selves were forged in the nuclear crucibles of the stars. We are not the center of the universe. Yet we can find awe and beauty and inspiration in being connected to our universe in a literal as well as metaphorical sense. Oppy’s journey has ended. But our larger journey, “to follow knowledge like a sinking star, beyond the utmost bound of human thought” (Alfred, Lord Tennyson), has just begun. Gregory A. Clark, associate professor of biomedical engineering at the University of Utah, acknowledges and appreciates his personal connections with multiple persons involved with these missions. He remains optimistic about the eventual discovery of extraterrestrial life— although not, as Brigham Young proclaimed, on the sun.